It’s no secret that the federal government has been eradicating environmental protections and altering the mission of many of the Administration’s environmental and natural resources agencies over the past year and a half. Some states are combating this assault by enacting state laws to protect the vital environmental resources that support their public’s health and local economies. But North Carolina is instead making a bad situation worse. The state’s General Assembly has been at it for a while – dismantling environmental protections, and the agency charged with enforcing them, for more than seven years. And now that our legislature is led by a super-majority, built on unconstitutionally gerrymandered districts with the power to override the governor’s vetoes — the assault has never seemed more caustic. “Since 2011, when the current majority took control of the North Carolina General Assembly, every legislative session has seen new laws and amendments to existing laws that have eroded and dismantled important protections for the state’s environment,” says a 2016 report by the Southern Environmental Law Center titled, Dismantled. Our state’s story of the systematic weakening of environmental protections in favor of supporting corporate carelessness is eerily similar in some ways to that of the federal government. In 2011, an NC legislator drew a bulls-eye on his office window; in the center of it stood the building that housed the Department of Environment and Natural Resources (DENR, now the Department of Environmental Quality). Two years later that legislator, despite his clear disdain for environmental regulation — or more likely, owing to that disdain — was appointed assistant secretary at DENR. Sound familiar? Check out EPA Administrator Scott Pruitt’s LinkedIn page, where he actually describes himself as “a leading advocate against the EPA’s activist agenda”; the fact that it is so brazen should alarm anyone that is not already terrified. 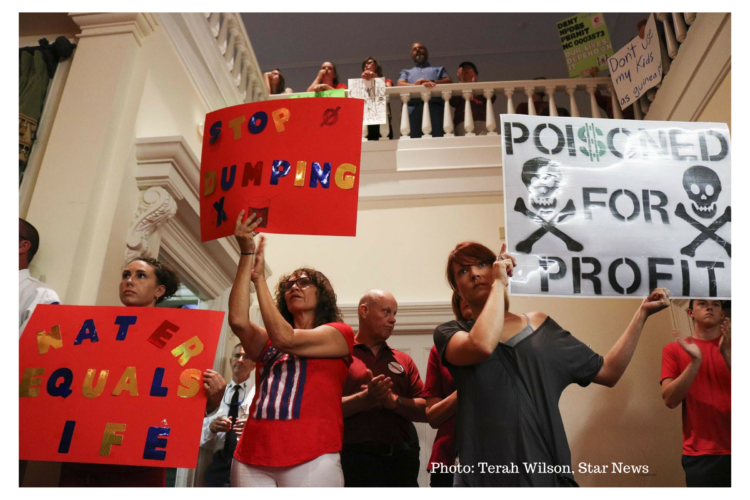 This push laid the foundation for today’s consequences – outrage, and lawsuits, and illness — and fear that the illness may be caused by the ordinary, and previously presumed safe acts of drinking water and breathing air. Just in the past few days, the NC General Assembly has shamelessly crafted, passed, and passed again (through overriding the governor’s veto) a bill that gives a free pass to pollute to the multi-billion-dollar corporations managing the thousands of industrial hog and poultry facilities found near primarily low-income, minority communities in rural North Carolina. It all but removes the ability for neighbors of these facilities to get compensated for property devaluation, and health and quality-of-life impacts (legally termed “nuisances”) caused by the industry’s antiquated waste management practices whereby liquefied animal waste is stored in open-air cesspools and then sprayed on land near people’s homes. Why would the NC General Assembly insist on this bill? Because a federal court recently ruled in favor of the citizens living near these facilities, and the NC Pork Council and Smithfield got nervous and bent the ears of our elected officials to whom they make generous campaign contributions. In another example of corporate overreach, a few weeks ago, a lobbying group that represents manufacturers, including Chemours — the company that has been found to be dumping toxic chemicals into our drinking water supply — asked for three changes to budget legislation regarding water quality concerns brought on by the company’s wastewater discharges and air emissions. It got all three. This provision, which became part of the budget, was effectively approved by the legislature twice, after another veto attempt by the governor was quickly overridden by both houses. The new language limits the scope of research to be funded to no longer allow scientists to look for chemicals and compounds that have not yet been identified in our waterways. They can only report on compounds already identified – so contaminants like GenX and the other so-called ’emerging contaminants’ will not be discovered using these funds. Why would our legislators not want us to know what possible life-threatening chemicals may be lurking in our drinking water supplies? Preston Howard, the president of the NC Manufacturers Alliance told them it would dissuade manufacturers from relocating or expanding their businesses in our area. Again, the similarities between our state and the federal government’s response to environmental threats are staggering. An email disclosed under the Freedom of Information Act showed that an unidentified White House staffer warned the EPA that the release of a federal study about per- and polyfluorinated compounds (PFAS), like those in our drinking water supply – could be a “public relations nightmare” for the Trump administration, since it made clear that the EPA significantly miscalculated the proposed ‘safe’ levels of exposure to some of the most widespread PFAS compounds, found in almost every humans’ blood and continuing to accumulate all over our country. EPA Administrator Pruitt (self-proclaimed ‘advocate against the EPA agenda’) suppressed the report. It was only released last week due to extreme, bipartisan pressure from the public and members of Congress. SELC’s report points out that state law now prohibits the passage of any environmental protections in North Carolina that are more stringent than federal laws. This is becoming increasingly unnerving as the bar set by the feds continues to drop. With the double-threat to our environment from both the state and federal government, it’s up to us to make sure our voices are heard. We need our elected leaders to put people over corporate profit. While our influence over the Administration’s version of the U.S. Environmental Protection Agency may be limited, we can affect change here in North Carolina. Below are the numbers for our regional leadership in the Senate and the House. Give them a call and speak your mind. If your senator and representative are not listed, or you’re not sure who represents you, click HERE and enter your address. My representative us Deb Butler who, as far as I know, is usually voting on the side of the environment, rather than the polluters. I am grateful for that, and I am grateful to you for the work you do. I have been a citizen of this country for only 8 years and am still learning how our governments work. – What else can I do to help change NC’s government from one that works for the polluters, to one that works for the people and the well-being of our state? Thanks so much for reading and for you important question! You’re already doing a lot just by keeping informed. Our government is quickly passing both state and federal legislation that will harm our environment. Calling your legislators in both the state and federal gov’t is key – but also sharing information with your friends and family is vital. Environmental stewardship starts with education. Thank you Hedi!